A French country bed that's perfect for your country French bedroom is easy to find: Decorating a French country bedroom offers choices galore. 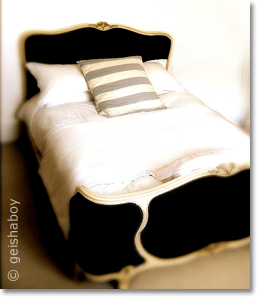 Antique Rococo (Louis XV) style beds, like corbeille & capitone beds. For more country French bedroom design ideas and inspiration, read on below! Found what you're looking for? If not, do check out the country French bedroom and French provencial furniture listings on eBay as well (US listings only) - you'll find antique country French beds, including white provincial bedroom furniture and corbeille bedsteads. Creative French Country Interior Decorating. French Country Bed - Which Style? There are no fixed style rules for Country French bedroom design - except that it should be warm, relaxed and inviting. So your French country bed is completely up to your personal taste! You don't need any particular style of antique French bed frames, or a French provençal bed, or a Louis XV headboard. You could even create a French look with nothing but a headless, footless platform bed! A French bed crown with elegant fabric panels that surround your bed head. Pictures (from a book, or post cards) of old French prints: etchings, illustrations, architectural blueprints - or old photos of villages, châteaux, and iconic French city/landscapes. A French antique(-looking) piece, e.g. a chest/chest of drawers/chair/sofa/ornate mirror/armoire. Faïence, porcelain or earthenware plates (on the wall) or jugs/bowls (on a side table). as well as the page on French Wall Art! How Elegant Should A French Country Bed Be? As elegant as you want. No shabby chic required - go for fine polished woods or intricate iron scrollwork if that's what you like best! Since the most successful French country decorating ideas are mixes of old and contemporary elements, you may want to combine a fine, new French country bed with an antique coverlet or a Matelassé Bedspread, while you would spruce up a distressed, painted bed with pristine white lace pillow shams. While Louis XV's reign ((1715-1774) saw the rise - and fall - of the playful, ornamental Rococo style, his successor Louis XVI (1774-1792) embraced the restrained proportions and straight lines of Neoclassicism - a style that evolved in the wake of the (re-)discovery and excavation of the ancient cities of Pompeii and Herculaneum (near Naples, Italy). The antique ruins allowed a rare glimpse into the life of real Romans, preserved under several yards of volcanic ash after the fateful eruption of Mount Vesuvius in 79 AD. It was a discovery that sparked a bit of a craze for all things classically Italian, and classical lines informed much of French furniture after 1800. During the reign of the last French king, Louis Philippe (1830-1848), French bedroom design had a straight, simple and elegant look, with rounded edges and dark polished wood. The period between 1830 and 1870 saw a short Rococo revival - and many of the antique "Louis XV" beds on the market today were actually made in the late 1800s (or even the early 1900s), rather than during Louis XV's reign. The oldest lit bateau ("boat bed") dates back to 1800, when Napoleon Bonaparte was Consul of the First French Republic (before he proclaimed himself Emperor in 1804). Here's a picture! The style, inspired by the Roman, Greek and Egyptian antiques that were coming to light during this period, became a favorite on both sides of the Atlantic, and has remained so for the last 100+ years. (A "sleigh bed" is usually lower at the footboard, while a lit bateau has head- & footboards the same height). A sleigh bed makes a perfect French country bed, either in a dark wood finish or in its painted and distressed, shabby-chic incarnation. Iron beds (and later steel beds) first made their appearance around 1850. White metal beds and black metal beds soon became popular around the Mediterranean, France, and England. Beautiful antique iron beds have abundant scrollwork and are a perfect fit for a French country bedroom. But even the pared-down, no-frills variety works beautifully in country French bedroom design. In French decorating history, canopy beds were pretty much reserved for royalty. No commoner would have dreamt of having a canopy bed in their humble dwelling! However, in the 21st century, canopy beds are perfectly at home in country French bedroom design. I've included a few in the 'shopping list' above, and there's also a dedicated page about canopy iron bed styles. A French country bed with a canopy can be dressed up in cool, modern drapes or in the most dreamily romantic floaty chambray, tulle, or lace. Now, if you're after an antique French country bed, have a look at the current listings on eBay. I'm keeping my fingers crossed that you'll find the perfect bargain! Country bedroom ideas from the Northern & Western regions of France. Matelassé Bed Linens are the perfect choice for a traditional-looking French country bed. For more French iron bed choices, check out the Black Metal Beds, White Metal Beds, and Canopy Iron Beds on this site! Finally, have a look at this overview of French Country Decorating. Learn about using neutral color palettes with your French country bed (and everywhere else in the house, too!) Understand what makes neutral color schemes look their best, and what happens when you inject 'real' color into neutral color palettes. It's FREE!! Return from French Country Bed to Bedroom Interior Design Ideas. Return from French Country Bed to the Dream Home Decorating homepage.